DNA methyltransferase 3a and its regulatory factor (left) and DNA methyltransferase 1 bound to a short piece of DNA (right). Your body is built of skin cells, nerve cells, bone cells, and many other different types of cells. These cells are different shapes and sizes, and each type of cell builds a characteristic collection of proteins that are needed for its function. However, every cell in your body contains the same genetic information, encoded in strands of DNA. How does each cell decide which genes to use and which ones to ignore? Scientists have discovered that the information in DNA does not end at the simple genetic sequence of bases. Cells layer additional forms of control on top of the genetic code, creating "epigenetic" information that modifies the use of particular genes. In some cases, this control is performed by the positioning of nucleosomes. In other cases, bases in the DNA are methylated, modifying how they are read during protein synthesis. In the first minutes of life, when we are composed of a single cell, this epigenetic information has been wiped clean. In the fertilized egg, the methyl groups have been removed and every gene is like all the others. Then, as cells divide in the embryo, they have to make choices about what they are going to do--becoming skin cells or nerve cells or their particular fate. At this point, DNA methyltransferases come into play, and they add methyl groups to genes, shutting off some and activating others. The DNA methyltransferase DNMT3, shown here from PDB entry 2qrv , performs this important job, creating the proper epigenetic coding of methyl groups throughout the genome. Notice that both strands have a cytosine, so in a methylated region of DNA, both strands will have a methyl group. When the DNA is replicated, each of the new DNA double helices will have one old strand, complete with methyl groups, and one new strand, which is not methylated. So, DNMT1 just needs to look for CG base steps where only one strand has a methyl group. Bacterial DNA methyltransferase HhaI bound to a short piece of DNA. Bacteria also use DNA methylation, but they use it to protect themselves from viruses. They build restriction enzymes that cut DNA at specific sequences. Then, they build specific DNA methyltransferases, such as the one shown here from PDB entry 1mht , that add methyl groups to these sequences. The methyl groups block the restriction enzyme, but still allow proper reading of the bases during transcription and replication. So, the restriction enzyme floats around the cell with nothing to do, until a virus infects the cell. The DNA from the virus typically does not contain any methyl groups, so the restriction enzyme quickly chops it into pieces. 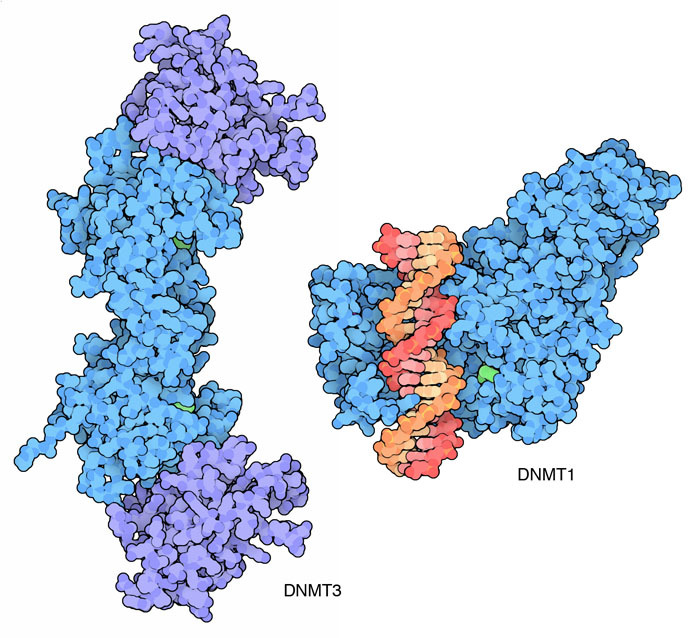 Several structures have helped to explain how DNA methyltransferases perform their jobs. PDB entry 3pt6 includes DMNT1 and a small piece of DNA. The enzyme wraps around the DNA and probes the edges of the bases in the DNA. This structure was solved using DNA with no methyl groups, which would normally not be a substrate of the enzyme. Sure enough, the structure shows that the enzyme recognizes the unmethylated bases on both sides, and holds the DNA away from the active site. 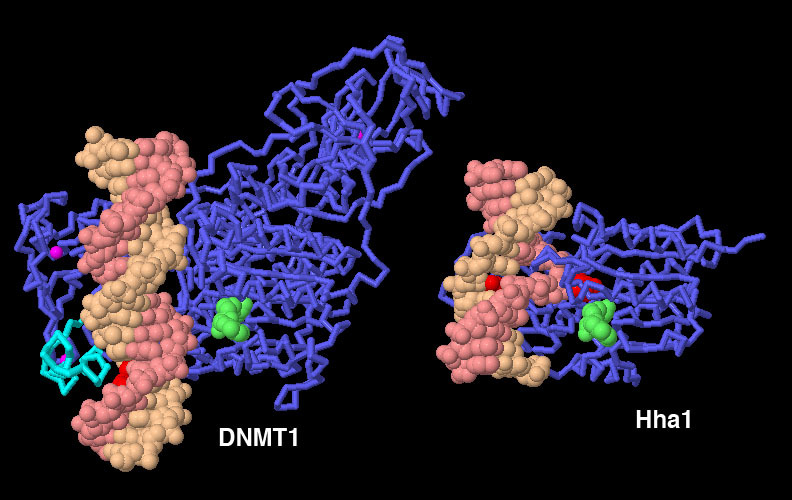 There is currently no structure of DNMT1 with a half-methylated DNA, but we can get an idea of how it might act by looking at a bacterial methyltransferase, pdb entry 1mht . The DNA binds deeper in the active site, and flips out the cytosine base that will be methylated. To take a closer look at these structures, click on the images for an interactive Jmol. The methyl group is provided by the cofactor S-adenosylmethionine during the methylation reaction. Many of the DNA methyltransferase structures were solved with the similar cofactor S-adenosyl homocysteine in the active site, but PDB entry 3av6 is DNMT1 with SAM bound. 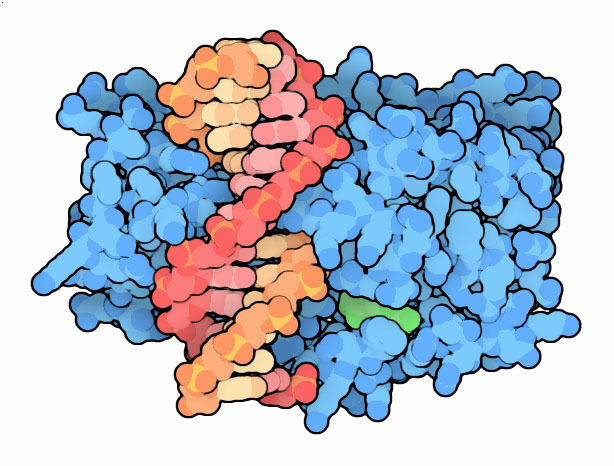 Can you find other enzymes in the PDB that use this cofactor? Are they performing similar reactions? You can use the structure comparison tool to overlap structures of DNMT enzymes and bacterial methyltransferases. Notice that the cores of the enzymes are similar, but the DNMT enzymes are larger. Why do you think our DNA methyltransferases need additional protein domains along with the domain that performs the reaction? R. Z. Jurkowska, T. P. Jurkowski and A. Jeltsch (2011) Structure and Function of Mammalian DNA Methyltransferases. ChemBioChem 12, 206-222. X. Cheng and R. M. Blumenthal (2008) Mammalian DNA Methyltransferases: A Structural Perspective. Structure 16, 341-350.